Are you noticing a theme yet?? I use the same two glass jars for all my seasonal mantles…what can I say, they just work! We usually have a small Christmas Tree in the living room but the theme this year is keep it simple. I added fake snow and ornaments to the apothecary jar and vase. I used greenery from my yard to add some color. My little tree stocking hooks came from Target a few years ago. I continued with the same greenery around the room to tie it all together. I have this vase and the bucket under the mantle. My Mom made this little lighted tree in a pottery class a few years ago. Well that’s it folks….simply, sweet, and easy to clean up :) Holidays make me wish I didn’t have that big TV over the mantle…I could do so much more! 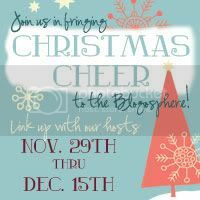 I’m linking to the following parties this week…be sure to check them out! If something works....stick with it! Great philosophy! Love the simplicity...yet elegant! Pretty and simple, my favorite combination!!! Your Decor is so sweet and simple! I'm Cortnie and one of your new followers! Thanks for sharing! You guys are so sweet...I was thinking my mantle was really lacking compared to what could be done but ya'll have left the sweetest comments. Thanks!